Starting September 11, 2018, the Beach Walker complex pool was closed for renovations that were expected to last until approximately April 6, 2019. On March 7th, we received an update stating that the pool is now expected to be finished in mid/late July at the earliest. We are very disappointed to hear of this latest update because of the impact it will have on our guests. During this time, the pool area (including grilling area) will be completely closed along with the boardwalk from the Beach Walker C & D buildings to the pool. This affects access to the beach and guests will have to use alternative access points at the Beach Walker complex instead of the main boardwalk. At this time, there is not an alternative pool that we can offer to our guests. Because of the pool closure, we will be offering discounted rates during this time for anyone who still chooses to stay at Beach Walker. Please let us know if you have any questions and we'll be glad to help. We appreciate your understanding. Gorgeous oceanfront villa with great ocean views. Located in the popular Beach Walker complex, it offers a great layout, spacious complex pool, and convenient beach access. This villa offers a unique multi-level design, with an open concept kitchen/living area on the main floor and bedrooms on upstairs levels. Enjoy ocean views from the living/dining area and master bedroom. This villa is convenient to the beach, pool, biking/walking trails, and the wonderful shopping and dining options on the resort. Or, make the easy drive into Fernandina Beach and enjoy the charming downtown area with many great shops and dining options. This villa is the perfect setting for a beach getaway and has been beautifully decorated and well-stocked. All of this for a great rate! With this rental, guests enjoy access to the beautiful and spacious Beach Walker pool, beach, walking and biking trails, spa, shops, and many great dining options. Golf is available at many great courses on the island.. Bike and golf cart rentals also available - please inquire for additional information. Please note that there is restricted access to the main hotel pool, fitness center, shuttle service, and Racquet Park to only club members and their guests. We will gladly answer any questions about activities and amenities. 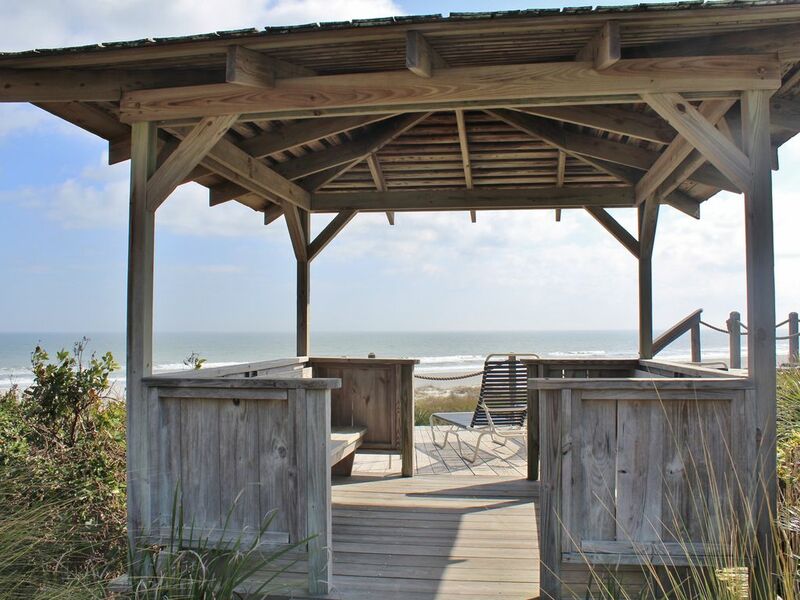 Please be advised, this property is not a rental through Omni Amelia Island Plantation and does not give you access to "resort privileges or amenities." We are happy to suggest alternatives to any of Omni's restricted amenities. If you have any questions or concerns, we would be glad to discuss by phone or email. Golf available at a number of local courses on the island, including Oak Marsh course on the Plantation. Please inquire for more information. Enjoyed are stay despite pool repair taking place. Well stocked. Many stairs. The condo was great. Lots of steps but I like how the master bedroom was by itself on the third floor. We had a wonderful stay at 1138 Beach Walker. The owners have thought of everything. The condo was spotless, decorated tastefully and not crowded or cluttered. Our first trip to Amelia and are planning to return. I would recommend this condo. Great location and beautiful view. Loved the updates to the bedrooms and living spaces - comfortable and beautifully decorated. Kitchen and bathrooms could use a little love, but they are more than adequate. The drains in the showers could use some Draino, though. Overall an excellent experience! Thank you for taking the time to review your stay. We are happy to hear you were pleased with your stay. We value your opinion and thank you for letting us know on the drains. We have taken care of the slow drainage since your stay. There are things we don't catch during our walk through before guests arrive, again, we thank you for letting us know on this. We will look forward to your next stay with us! Thank you for taking the time to review your stay. We are happy to hear you enjoyed the condo and the lovely views it has to offer. It is important to us that each guest feels comfortable and at home during their visit to our properties. We hope to have you back as our guest! We have been coming to Amelia for years and it was our first time in the Beach Walker Condos. Overall we were very satisfied with the condo. Ryan with Destinations Amelia is a pleasure to work with. Our family loves to pick up fresh seafood at the marina and cook supper together instead of eating out. The kitchen is not stocked for a "cook's kitchen. If I were to rent this condo again I would like to see sharp knives, a stock pot, salad bowl, bread basket, and serving platters. I realize that many people do not cook on vacation so the kitchen would not be important to them. The master bedroom has a beautiful view. Thank you for taking the time to review your stay! We are happy to hear that you enjoyed your stay. The next time you visit, let us know what time dinner will be :). We do stock the kitchen with the necessities and can understand how some of the not so common items might be missing. We take an inventory of everything periodically throughout the year and will look into adding some of the items you mentioned. We enjoyed having you and look forward to your next visit! Rates subject to change during holidays & special events, including: Concours D'Elegance, Spring Break, July 4th, Labor Day, Georgia/Florida, Thanksgiving, & Christmas/New Year's. Spring break & summer peak season rentals are Saturday - Saturday only, unless dates are available less than a month out. Check-in time is 4:00 pm. Check-out time is 10:00 am Please inquire about cancellation policy.